Let me begin by thanking the "powers that be" for this truly amazing honor! When I heard my tank was being featured, I was overcome with a sense of excitement I haven't felt since my daughter was born. I surmised I felt this way because I was either emotionally "out to lunch" or REALLY, REALLY, REALLY excited about being selected (my wife would pick option A). Anyway, to be in the company of prior "Tank of The Month" honorees is a privilege and a real thrill. Isn't it always your parents' fault? 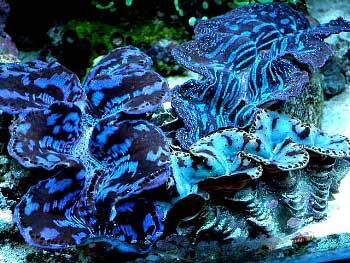 My father indirectly planted the reefkeeping bug inside me when I was a youngster. He kept a couple of rather large saltwater tanks when I was a kid, and I fondly remember accompanying him on many trips to the fish store. It is ironic now because he sometimes accompanies me to the fish stores since he stopped keeping tanks years ago. Nonetheless, I learned a lot by just being around someone with a strong interest in the hobby. I actually didn't have a tank to call my own until after I graduated college and was working in the "real world". It all began so innocently at a New York City street fair called the San Genaro Festival, where I won a goldfish. It was amazing that I even got the fish home since my future bride and I had celebrated rather excessively that night. The tiny bowl that came with the fish made me feel sorry for the critter, so I decided to go out and buy him (or was it her?) 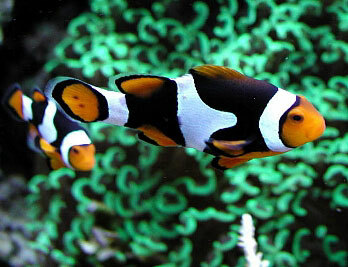 a more suitable home: a one or two gallon tank. I believe that fish lasted two weeks or so. Despite the bad experience, I was hooked, and I guess you could say that it was all downhill from there. I went from owning a 29 gallon fresh water aquarium with many fish and live plants, to a 90 gallon acrylic tank. The 90, which replaced the 29, was my first reef tank. I have now been a "ReefBum" for approximately 10 years. 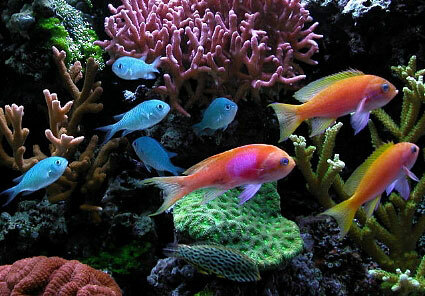 The aquarium, which has been up and running for two years, is a custom-made 120 gallon Starphire glass tank. I chose Starphire glass since it is clear, not tinted green, as is in standard glass tanks. What you see is what you get. The effect is amazing brightness and clarity; similar to acrylic, in a tank that's not prone to scratches. 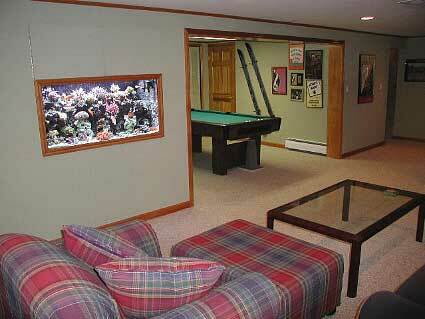 The tank is built into a wall and is accessible from both the front and back. Cabinet doors were added to the front on top to provide easy access for feeding and aquascaping. A closet was constructed behind the tank to house all the necessary plumbing and equipment. A 30 gallon sump sits below the tank in my "fish" closet. One GenX Mak4 external pump (1,200 gallons per hour) draws water from the sump, passes the water through a ¼ HP Universal Marine in-line chiller before ultimately returning it to the tank. 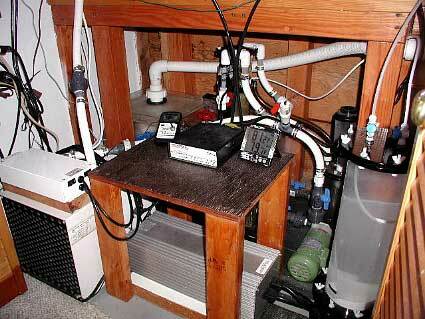 An identical Mak4 pump drives water from the sump to an in sump ETS 750 Reef-Devil Gemini protein skimmer. I use 250 lbs. of premium Fiji and Marshall Islands live rock for biofiltraton. Approximately 50 lbs. of ESV fine grade sand and 15 lbs. 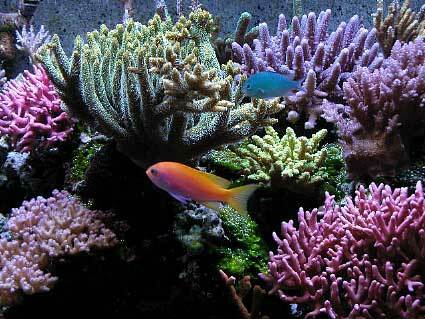 of live aragonite reef sand round out the biological bed. Mechanical filtration consisting of a pre-filter sponge in the overflow box and a filter bag in the sump keep the water crystal clear. Two bags of Chemi-Pure are utilized for chemical filtration. Flow from the Mak4 return pump is supplemented by four Maxijet 1200 powerheads. The Maxijets are driven by a RedSea Wavemaster Pro Wavemaker. Total circulation in the tank is approximately 2,200 gallons per hour. In retrospect, I should have done a better job in designing the tank to avoid using so many unsightly powerheads. Only one hole in the euro-brace top was drilled to accommodate a bulkhead for the return line. If I had to do it again, at least one or two more holes would have been drilled for a closed-loop circulation system. 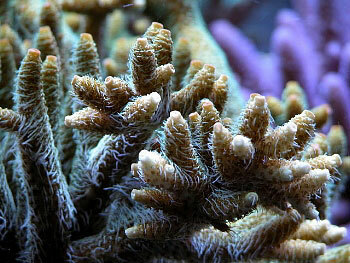 Of course, having pumps on the outside creates more room for corals, especially Acropora!!! Two of the powerheads are secured to the tank with a pair of algae-cleaning magnets. I came up with this idea because the suction cups on the powerheads never held well on the glass. 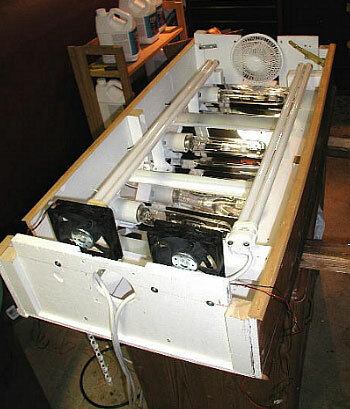 A dual chamber MyReefCreations calcium reactor is employed as the main engine for sustaining calcium and alkalinity levels. The reactor is filled with CaribSea ARM media and is fed by a line plumbed off of the main return line. The steady feed from the return really helps to keep the reactor "dialed in." Having a second chamber is key since it helps to dissipate excess CO2 in the reactor before it can escape into the tank. The net effect is an effluent with a higher pH than what is normally seen with a single chamber reactor. The unit is extremely efficient and nearly maintenance-free. The media is changed after four months, while the 10 lb. CO2 tank generally lasts five to six months. 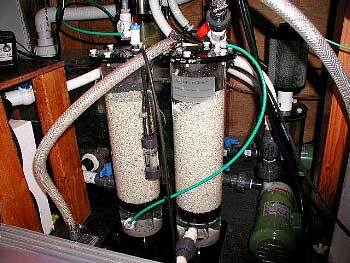 An EcoTech Marine kalkwasser reactor is utilized for additional calcium and alkalinity supplementation. Presently, ten heaping tablespoons of ESV kalkwasser are added each week to the two-gallon chamber. Approximately 18 gallons of RO water are fed into the reactor and off to the tank each week via a LiterMeter dosing pump. The kalk reactor is a solid compliment to the calcium reactor since it boosts the tank's pH, besides augmenting calcium and alkalinity. Prior to adding these reactors, I had been using ESV's two-part calcium and alkalinity system. I made the switch because it became too costly dosing 180 ml of each component on a daily basis. 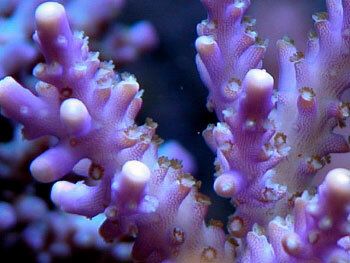 In the end, it was my love affair with those calcium "hogging" Acropora species that necessitated the change. Lighting consists of three 400-watt 20K Radium bulbs and two 96 watt power compacts (one actinic & one full spectrum). The halides are run on a PFO dual HQI ballast while the power compacts are also run on a PFO ballast. SpiderLightTM reflectors are used for the halides, which are on for 10 hours a day (PCs are on for 11 hours). A retrofit system is used for the lighting. The canopy was built out of plywood and other scraps I had around the house. The inside of the canopy is painted with flat white oil-based paint. Two four inch Icecap variable speed cooling fans and one six inch conventional fan over the top of the tank help keep the canopy cool and promote evaporation. The front of the canopy is on a hinge and can be lifted up, enabling me to reach into the bottom-half of the tank. By the time this article is published, I will be in the midst of a little experiment (isn't this hobby great for people who like to tinker!). I am going to try some new reflectors with the hope of achieving a greater and more even spread of light. 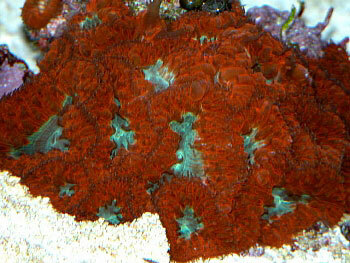 A couple of my frags are "burnt" or bleaching in spots, so it appears the tank does have a "hot spot" or two. I have read some very good things about how well Lumenarc III reflectors spread light, so I have decided to give them a try. These reflectors are big (19.5" L x 19.5" W), so I will only be able to run two halides, not three, since my tank is 48" long. I will also be cutting back to one power compact (the full spectrum bulb will remain), due to the new space constraints. The bulbs will be mounted parallel to the tank's water level, not perpendicular as they are in the current setup. 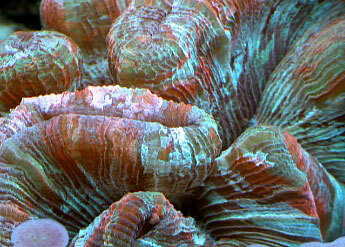 My ultimate goal with the new configuration is to keep coral colors and growth rates close to where they are now. It will be a big win if I can pull this off, since the chiller won't be taxed as much with one less halide emitting heat. There will also be two less bulbs to change and lower electric bills (saving money is GOOD!). Consequently, evaporation will probably be lower so I will have to monitor how this impacts kalkwasser top-off additions. 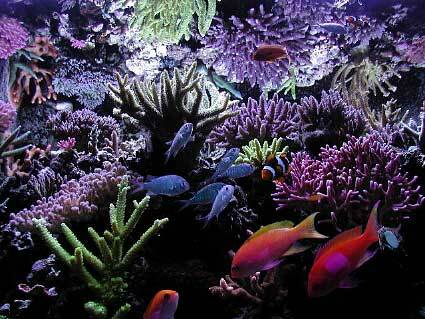 I perform a five-gallon water change every week using Tropic Marin salt mixed with RO water. Additionally, each week the sponge in the pre-filter box is rinsed clean and the sump filter bag is "de-grunged" in the washing machine (of course, no soap is used). The skimmer collection cup is also wiped clean weekly and the waste cup is emptied every two to three weeks. The front of the tank is cleaned every other day using a pair of algae-cleaning magnets. Every month I calibrate my pH monitor and empty out and clean the kalk reactor. As I mentioned before, the ARM media in the calcium reactor is swapped out every four months. Biweekly tests are conducted with Salifert Ca and dKH kits. Salifert Magnesium, Phosphate, and Nitrate kits are used on rare occasions. 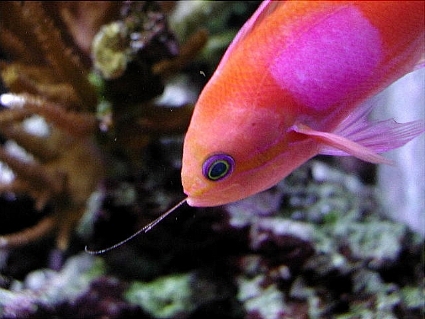 In regard to feeding, the fish are fed daily with a chunk of frozen Mysis shrimp, one Brine Plus cube and a sliver of frozen "green stuff." 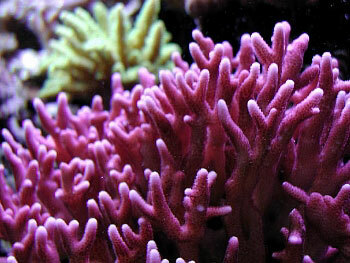 No additional supplements for corals are added to the tank. 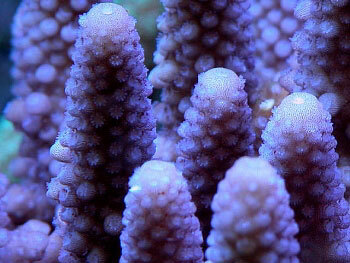 I am infatuated with Acropora, so specimens in this genus are featured prominently in the tank. 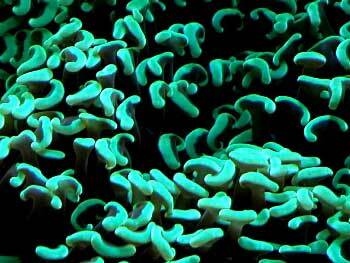 One of my favorites is a "show size" metallic green Millepora. 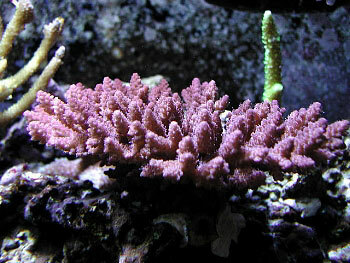 This coral was my first SPS coral in the tank and has grown like a weed. certainly not a bad problem to have! 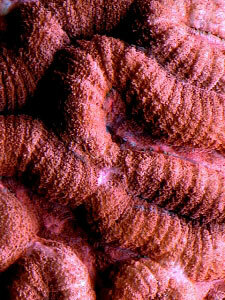 My bright pink Seriatopora specimens are really cool and are also personal favorites. Purple Rim Green Capricornis sp. 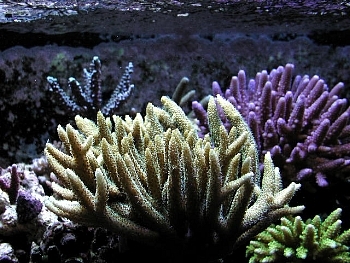 Some LPS corals are located in the bottom-half of the tank, including a red Lobophyllia, red Blastomussa, Frogspawn coral, Torch coral, Hammer coral, Cynarina, and Favites. 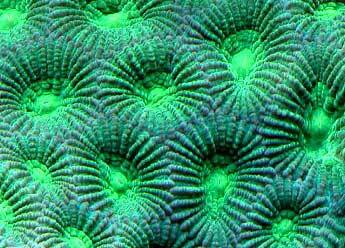 'Softies' include Zoanthids, Green Star Polyps, a bright yellow Leather coral and a beige Feather Leather. 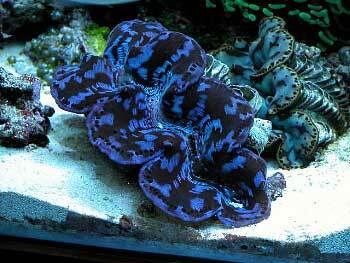 Four Tridacnid clams sit on the bottom in the sand bed. 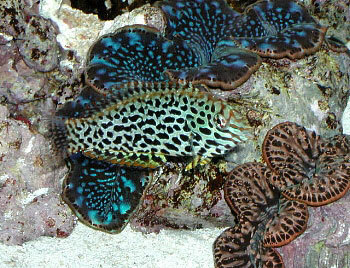 As for fish, my favorite is a Leopard Wrasse, which I have kept for three years. Specimens of this fish species are typically very difficult to keep alive, but mine has defied the odds by lasting longer than any fish I've owned. It even survived a tank crash which occurred two years ago. My wife and daughter deserve all the credit in the world for putting up with this obsession of mine. Thank God my wife really doesn't know how much this hobby of mine costs!! 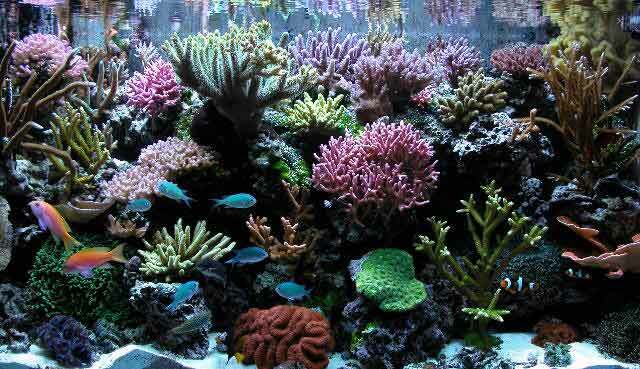 As I explained earlier, my father is the reason why I got into reefkeeping. Perhaps some time soon he will re-enter the hobby, although my mother will try like heck to prevent this since she fears for her new carpeting. I would also like to recognize Chris Jessen, who is the owner of Reef & Fin in Stamford, Connecticut. The knowledge I have picked up from Chris over the years has been invaluable. He was the one who hooked me on SPS, so I'm not sure if I should thank him or blame him considering the $$$ I've spent at his store. Click on the image below to visit Keith's website for more information on this tank.